David Foulkes was a man content with life when he boarded a Tube train bound for Edgware Road on the morning of 7 July 2005. The 22-year-old from Oldham was enjoying his new job as a media sales manager for the Guardian, based in Manchester. He was in love with his girlfriend, Stephanie Reid, 22, and had travelled to London that day to meet a colleague. Mr Foulkes lived with his parents, Graham and Janet, and sister Jill but was planning to move in with Ms Reid and start a family. Ms Reid said they had been together every day since their first date. David Foulkes joined the Guardian as territory sales manager for the North-West, which meant he was visiting local shops to promote the paper. He attended Hulme grammar school in Manchester, where he was a keen squash player and swimmer. He stayed on for the sixth form and then went to Oldham Business School, before getting his first job. His father, Graham Foulkes, has become one of the leading campaigners for the 7 July families. 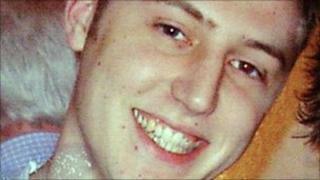 He told the inquests: "He learned to drive at 17. We bought David an old Volkswagen Polo and, after that, we saw very little of him at weekends. "At about this time, David found girls, or I should say they found him, because David was 6ft, very handsome and had a car. "I held my breath and had that dreaded man-to-man chat with him. We went to the local pub and I remember coughing and spluttering as I tried to approach the subject. "He caught on very quickly and assured me that he knew all about the birds and bees." Mr Foulkes, who played squash once a week with his son, added: "He was always delighted to beat dad, which he did all too often." He said: "I am extremely proud that David was a very thoughtful person who cared for the people he called friends. "In his group there were two unfortunate people who developed mental health problems and, as happens, the group moved away from them, but David did not. "He would visit them in hospital and always kept a lookout for them and, after their discharge, he encouraged them to rejoin the group and enjoy a normal, ordinary life." He added: "I cannot say what the future would have been for David. Who could? But I do know he would have made us proud and happy parents. "David is missed beyond words by all who knew him. He was a super lad who would never do anyone any harm." Hundreds of mourners attended his funeral at the church of St Anne in Lydgate, Oldham. Outside the church, flowers and tributes covered the ground. His former colleague Kaye Walsh said: "When things were tough David would always be there with his cheeky smile and wit that made us all smile again. "I cannot explain the loss we will all feel throughout our lives. "Not many people touch our hearts in this lifetime, but David did. His presence would light up a room."